A light controlled kinetic and sound sculpture inspired by antique Victrolas. The “grooves” on the handmade painted wooden records were created by digitally and physically interpreting data from a weather station and reflecting on the change of seasons. 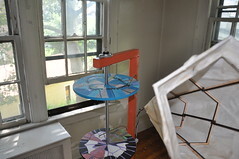 The installation is located in THE NEW YORK ELECTRONIC ART FESTIVAL Building 10b, part of Wave(form)s – an Exhibition of Electronic Art on Governors Island. The Painted Ponies Go Up and Down by The CCRT Collaborative is a light controlled kinetic and sound sculpture inspired by antique Victrolas. 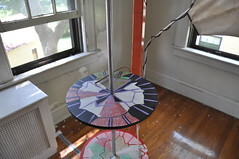 The “grooves” on the handmade painted wooden records were created by digitally and physically interpreting data from a weather station and reflecting on the change of seasons. Light sensors on each record react to changes in brightness on the painted surface to control a custom analog sound generation circuit. Cross Current Resonance Transducer (CCRT) is composed of LoVid (Tali Hinkis & Kyle Lapidus) and Douglas Repetto. They are interested in the processes of interpretation and evaluation that are inherent in human attempts to understand natural phenomena. Their investigation has expanded from an initial focus, which emphasized using standard environmental sensors, to an interest in building our own environmental monitoring devices as well as data visualizing sculptures, videos, and prints. CCRT has been collaborating since 2005, and have been working closely with Harvestworks for many years. 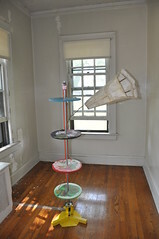 CCRT has received individual artist grants from NYSCA, Greenwall Foundation, and a Turbulence Commission from turbulence.org. Their work has been exhibited at The New York Electronic Art Festival and at 911 Media Arts Seattle, and free103point9’s Wave Farm Transmission Sculpture Garden.